We received an email the day before our longest travel day of the trip. We're travelling from Southern Germany (Konstanz) to Bruges. Its a long distance: there are at least six connections and none of the trains are particularly fast. We hadn't been looking forward to the journey to begin with. And now this. There's a strike. Trains are cancelled. We will eventually get to our destination as DeutscheBahn (the German Train company) has given us a slew of alternatives, but I'm sure even the computer sending the automatically generated email knows its not going to be a fun or smooth day. We left Gina and Lasse's flat bright and early to get a head start on what we knew was going to be a very long day. We arrived at the train station at 8am. The train people told us that they could get us on a train at 10:30am. And so it began. I was going to need a strudel. We got on the 10:30 train. So far, not terrible. Chuggin' along, as trains do. 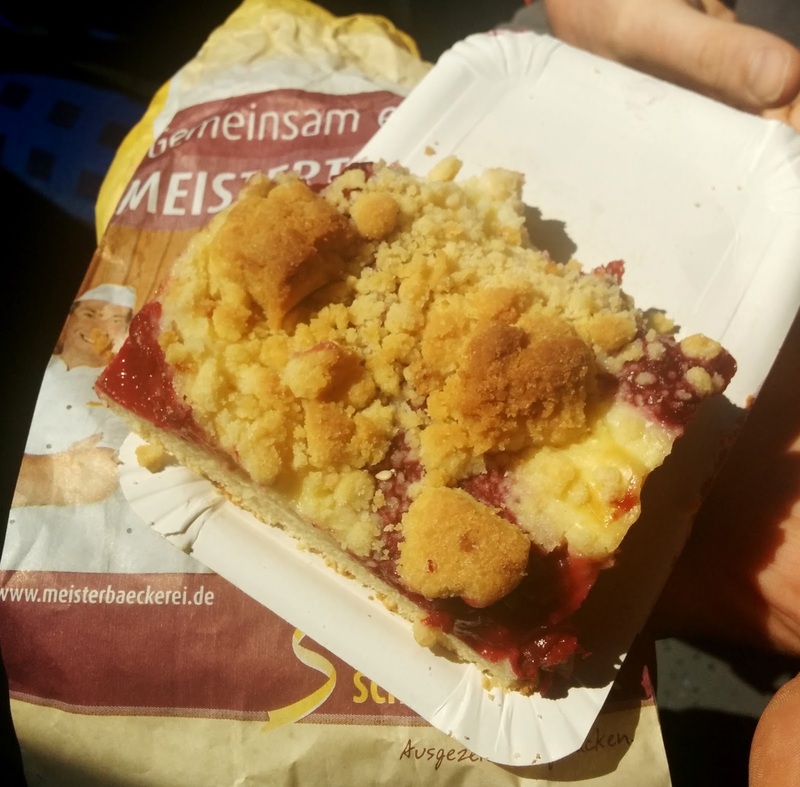 We rode a couple carefree hours, high on strudel power. The train stopped a mere 20mins before getting to our first connection stop. We were so close. Maybe its just an extra long stop, we think, after we've been stopped about 5 minutes. 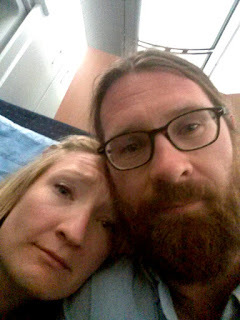 There was one other girl left in our train car. We saw her being there as a good sign. She probably speaks German and understood all the announcements that had been made over the loud speaker. They were probably saying 'Hey there folks! Sorry for the delay. We're running about five minutes behind and oh, by the way, that pesky strike has been cancelled. Next stop, Bruges!' The girl is happily tip tapping away on her phone, not perturbed, probably messaging her friends in Belgium the good news. Another five minutes goes by. A man comes into our train car and starts to vacuum it. Clearly this train is not going anywhere. My suspicions are confirmed when the man sees us, looks confused and then starts miming an umpire sweeping his arms dramatically across his body as an empire would to say 'safe!' Only we're not playing baseball and we certainly aren't going to make our connecting train. Strike. We spot a gaggle of people on the street across from the train station. After some fancy hand gesturing with the only train station employee not hiding in the bathroom, its confirmed. These people are our fellow unfortunate train passengers. We join the end of what is kind of a line. More like a mob. And no one is overly happy. We don't know where we're going, or how- but at least we're not alone. A beautiful young girl, in her early 20s wearing a superman shirt, hipster glasses and a long ponytail taps me on the shoulder and asks me something in German. I say, 'I'm sorry, I don’t speak German. But, if you happen to speak English and can tell us whats going on- that would be awesome sauce. She smiles and introduces herself as Milena. And then Milena becomes our perfect little translator/guide/BFF for the next eight hours or so. Yay for Milena! And Yay for English being taught as a second language all over the world! We've hit a home run with this one! We eventually get on a bus which takes forty-five minutes to get to the connecting train station. Having missed many connections at that point, and now having an hour or so to spare, we head across the street to a cafe that looks like its seeing more business today as a result of the strike then it has in the last decade. Milena is super helpful letting us use her phone to try and contact Kevin and Vicky in Bruges to try and give them a better estimate of our arrival time. But at this point, knowing how many more connections stand in our way, it was really just a guess. We bought Milena a drink as an inadequate thank you for all her help. Then we all caught another train together. We chatted and shared a baguette sandwich and it actually went by quite fast. When the conductor comes by to check out tickets Milena asks him about our odds of actually making it to Belgium that day. 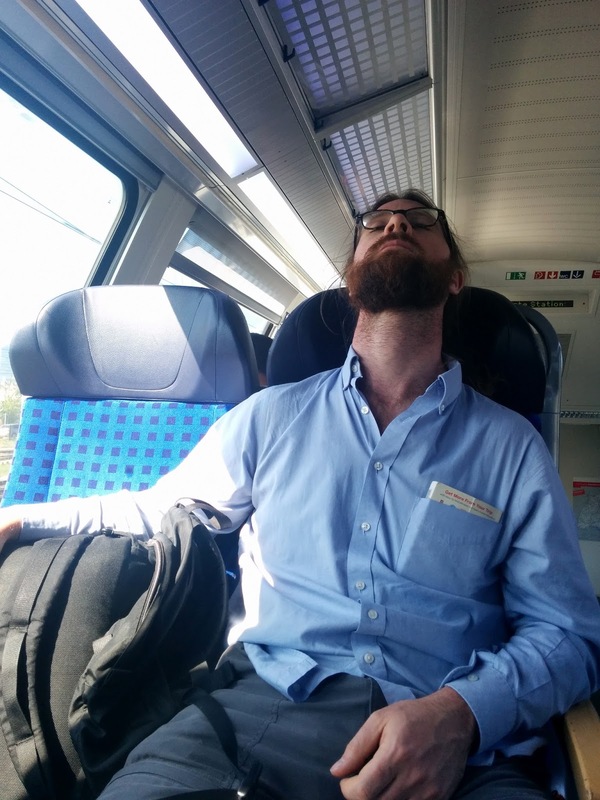 I don't speak any German, but I didn't need a translator to hear the conductor say 'no' and shake his head approximately thirty times in their brief conversation... 'He says “maybe,” Milena tells us. 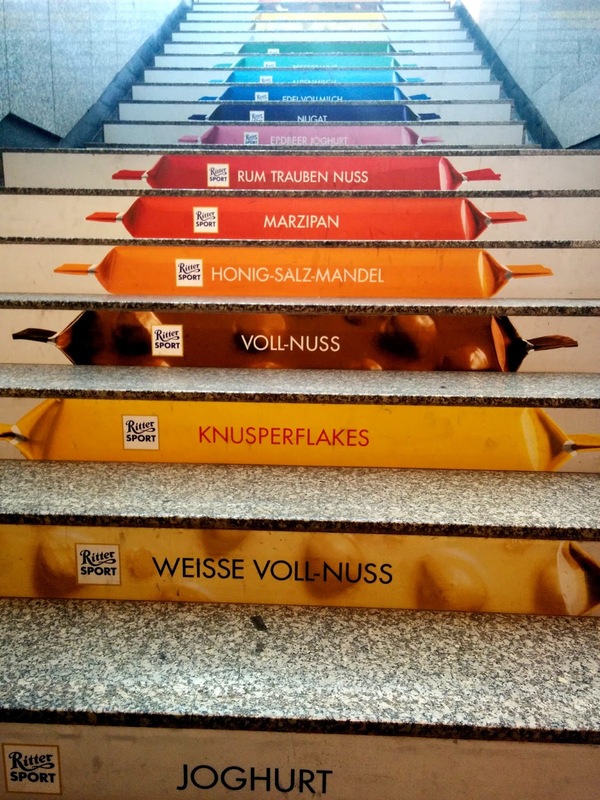 Thank goodness that the stairs in train stations are made of chocolate bars in Germany! We bid Milena adieu at our next connection and find ourselves on a train to Koln that is absolutely jammed. We find a tiny spot of spare carpet on the hallway floor in front of the bathroom and hunker down. As a result of J's need to photo-bomb people's personal photos we wind up chatting with a couple of Colombian students on their way to a conference. 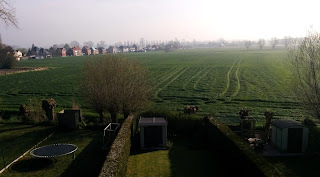 They are super impressed that we had been to their home country and, as a bonus, reminiscing about their beautiful country eases the numbness that was steadily taking over my behind. We missed our connection in Koln by half an hour. Missed connection #765, I think at this point. Our options were: (1) we could pay about $150 each on a train with a different company or (2) wait another hour for a connection that would be covered by our original ticket. We're striking out here! We decide to wait. The hanger (anger that is at least in part related to hunger) had been creeping up on me. It was definitely past dinner time at this point, and I had already eaten my emergency Rittersport chocolate bar. And Jon's (He practically begged me to- I swear it). And the one we had bought as a souvenir to take home (sorry, Mom). So, it was with J's well-being in mind, that we went in search of food at the station while we waited for yet another train. There was a mini convenience store and I stopped in while J perused nearby fast food chains. On the shelf next to some canned veggies I spotted a jar of hotdogs. A JAR of hotdogs. They were bobbing around in some liquid. Hotdogs in a jar. Come on. That’s fantastic. You want a hotdog, but don’t have time to cook it. No problem. Here's a jar of hotdogs I have in my cupboard for this very occasion! I took a picture with my phone so I could show J. Just then a guy stocking the shelves walks over and tears a strip off me for taking a picture of the jar of hotdogs. He apparently was mad because my photo had a label in it. The label of whoever had put the hotdogs in the jar. Was it a secret? Could no one else figure out how to do it? What if I bought the jar, took it home and then took a picture of my jarred hotdogs? With no shelf-stocking-hot-dog police in sight. What would happen then? It made no sense, especially considering his anger in relation to my crime. Maybe he just hates tourists. I get that. But, hello, over-reacting. I want to be mad, too! I've been on a train for twelve hours and all I want is a stupid picture of stupid hotdogs in a stupid jar! Who does this guy think he is? He even made me delete the picture and then show him that I deleted it. Needless to say, it wasn't a good scene and I certainly didn't buy anything from the mini convenience store at the Koln train station with the over protective shelf-stocker. 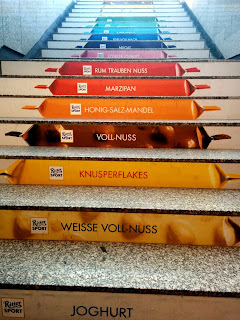 We hightailed it out of Koln happily; free again to take pictures of food products if so desired. Our train crossed into Belgium in the dark. A half hour in and we stopped again. No strike this time. Now it was a problem on the tracks. Sigh. Surprisingly, we're cautiously high-spirited despite this brand new setback. I took a picture of my Thai takeout (well, what's left of it) because I could. 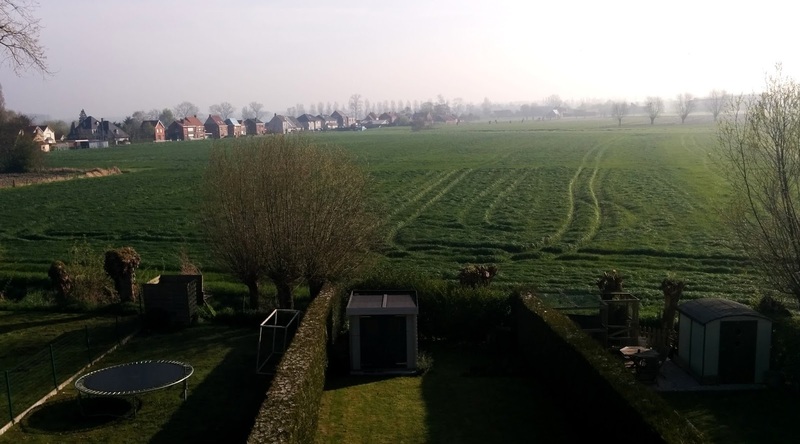 The good news- this train (hopefully on these tracks) would take us to Brussels from which there were connections to Bruges every 30-40 minutes. The end was in sight and we were definitely, probably, maybe going to make it to Bruges that very same day! The train started moving again. Yay! Of course, we arrived in Brussels JUST after one of the trains had left, but still.. we were in Brussels! So close. So close. So close. The anticipation!! Will we ever make it to Kevin &Vicky in Bruges? Meersburg was a fantastic day trip from Konstanz. 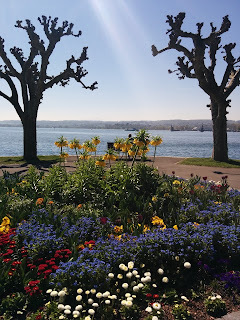 It had been snowing in Ottawa when we left early April and seeing Spring in full bloom in Meersburg was a welcome sight. Tulips were bursting with colour, trees were blossoming pink and planter boxes were full. It would be another month at least until Ottawa's tulips graced us with their presence. It was a great time to be exploring another part of the world. 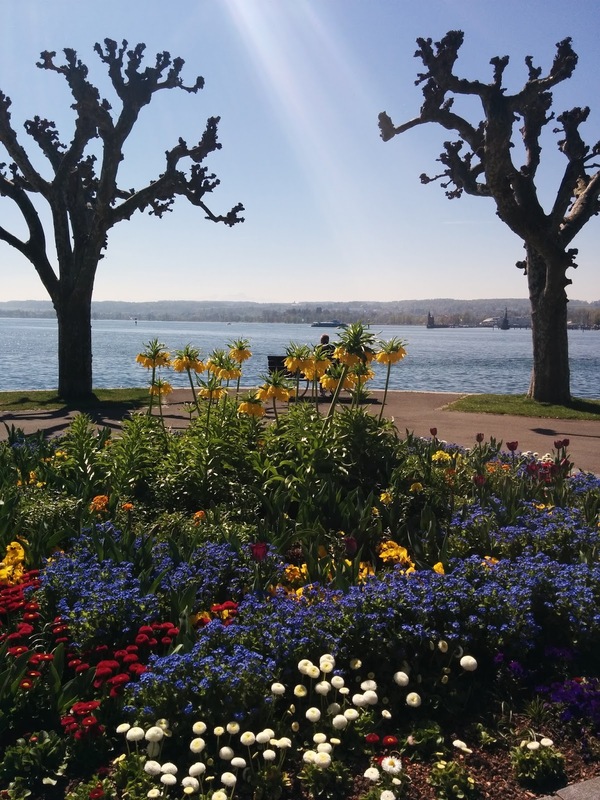 We walked along the lakeside path from Konstanz to the ferry port. We easily caught the ferry headed across a narrow part of the lake to Meersburg and spent the entire day aimlessly wandering the winding streets, admiring the castle's lofty location and ancient grandeur, snapping countless pictures of the very photogenic squares and houses and picnicking on fresh bread and cheese. Yet another place on the lake where gorgeous Spring afternoons seem to slip away. Having local friends is a huge advantage when travelling for lots of reasons. Specifically, at the moment, I'm referring to a reason that is very close to our hearts. Food. Locals always know where to find the best a town has to offer. Gina and Lasse led us to the best beer, gelato and KD. Ok, not really KD, thankfully. A much more delicious version of cheese laden noodles.. Kaze Spaetzle. Oh boy! 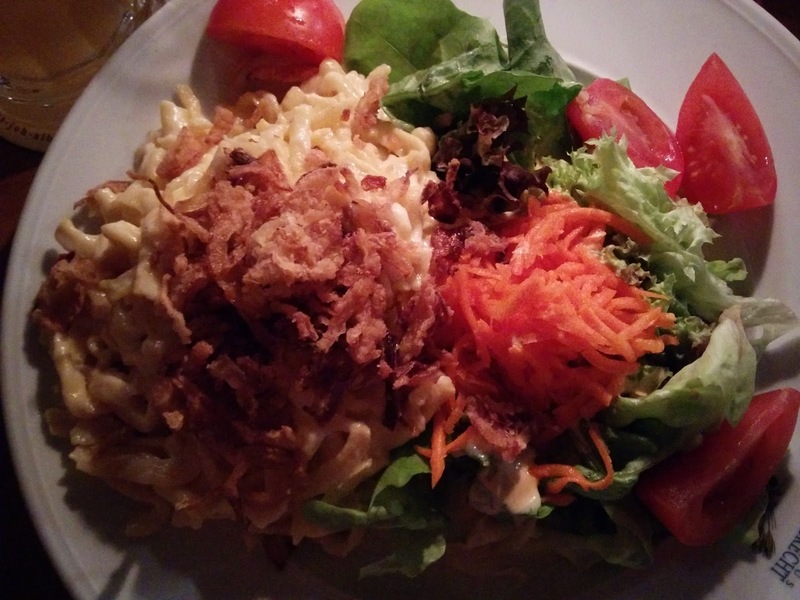 Cheese and thick noodles topped with little fried onions. Any country where its acceptable (nay, encouraged) for adults to order an entire meal of noodles covered in copious amounts of cheese is a country that I'm a fan of. If you didn't realize that this shape was in fact the outline of the lake, it would be an intriguingly odd thing to see everywhere. J thinks is looks like a squashed frog (nice). I'm more inclined to say a downward swimming scuba diver (if you squint at the map below, I'm sure you'll see it my way)? Either way, its up for interpretation, and its definitely a conversation starter if you're ever lucky to find yourself in this gorgeous spot. Now that we've been home from this Europe trip for a while, the beloved lake has popped up one more place.. on our fridge! 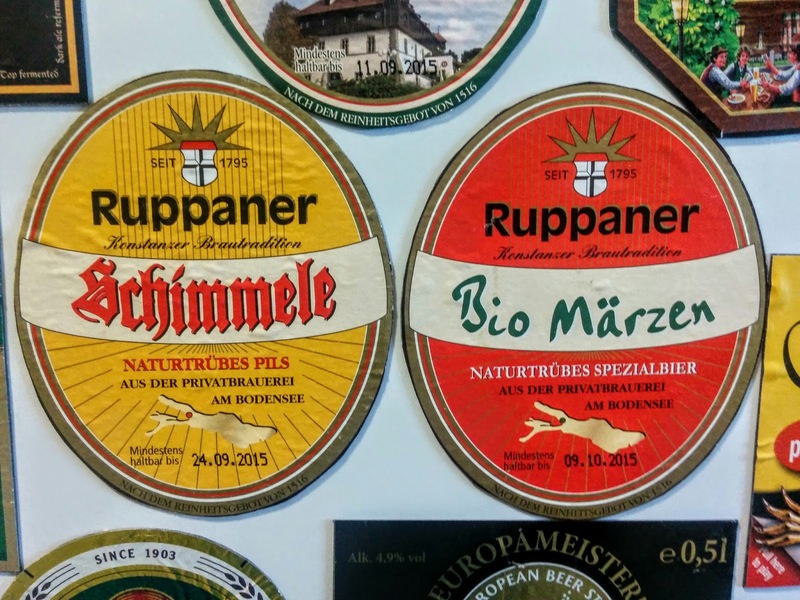 And our home-made Beer Label Magnet Collection (now that's a mouthful!) is all the better for it! Here's the shape of the lake from Google Maps... What do you think? Konstanz, Germany. The town is just so...cute! But really, everything about the old town (and the Old Old town) was adorable. The fountain with little wacky animals spitting out water under the watchful eye of a gigantic horse, the coloured buildings and accompanying shutters, the narrow cobblestoned alleys in the oldest part of town... and all set on a sparkling blue lake complete with mountains rising up behind it like a water colour painting. 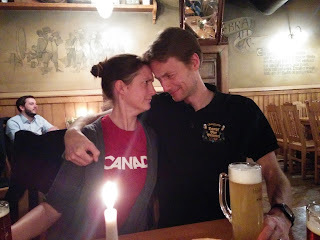 Its easy to see why our friends Gina and Lasse fell in love with the spot. Konstanz is in Southern Germany. Its actually the only part of Germany that is South of the Rhine. 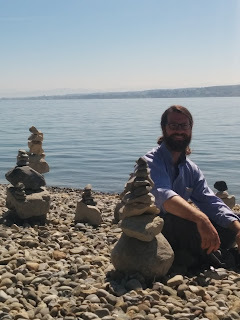 And if you draw the line between Northern and Southern Germany along the Rhine, as our friend Gina does, then, quite logically, Konstanz definitely holds claim to be considered the only “real” Southern Germany. That’s one of the things we love about Gina, she's super funny and sees things differently then most people do. Anyway. We liked the thought. 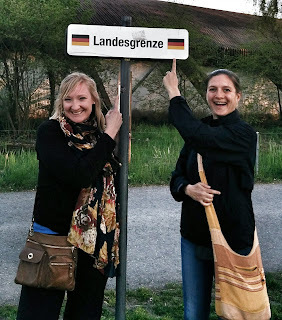 AND, by these new parameters, it was our first time in Southern Germany! Trailblazing? Check! 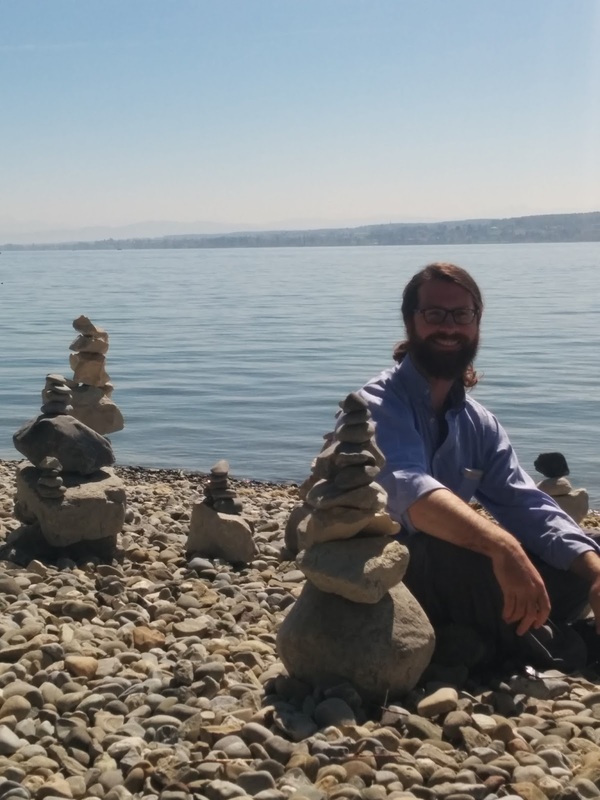 Along with the mighty Rhine and Lake Konstanz itself, Konstanz town borders Switzerland as well. We walked there one night. To Switzerland. Mostly because we could. There are little street-sign-like-signs along the otherwise invisible border. One side says Germany, the other, Switzerland. That and the twenty-two curious red sculptures that were installed where the international border once stood guarded, are the only indication that you've left the country. It was so funny to hear Gina and Lassse talk so casually about how they went for a run in Switzerland. Oh, Europe and your borderless borders. We love you. For such a small city (approx 80,000 people) there is a lot to keep one entertained in Konstanz. The lakeside Beer Garden being among the most fun ways to while away a gorgeous, sunny afternoon. Drinking tall, cold, yummy beers, watching the mountains that surround the lake fade into and out of the distant haze. It was a rough stop for us, that beautiful Konstanz. The mountains themselves were a bit of a puzzle. You could see them just fine, but if you tried to take a picture of them, they would disappear like ghosts on the picture play-back! It was one of the many times when travelling that a picture really couldn't do the scene justice. soaking up the undeniable feeling- yup, I'm in Germany. And its awesome. P.S- Sorry this blog post is SO late! We're catching up now- I promise!